Happy new year! I hope 2012 is starting out well for everyone. I had a fun time at my friend’s party and the champagne cupcakes were a huge hit. I think next time I may try them with the Pop Rocks on top. Fun, huh? Because the cupcakes only required 1/2 cup of sour cream, I had some leftover. So the other night when I was awake at 3 in the morning thanks to the crazy man setting cars on fire in my neighborhood, I googled sour cream bundt cake recipes. Side note: I’m happy and relieved that the LAPD now has a “person of interest” in custody and I hope when he goes to jail he’s subjected to random middle of the night blazing siren and hovering helicopter sounds like those of us in Hollywood have had to deal with. Anyway, the cake is a bit time consuming and you’ll end up with a sink full of dishes, but it’s definitely worth the time and effort. 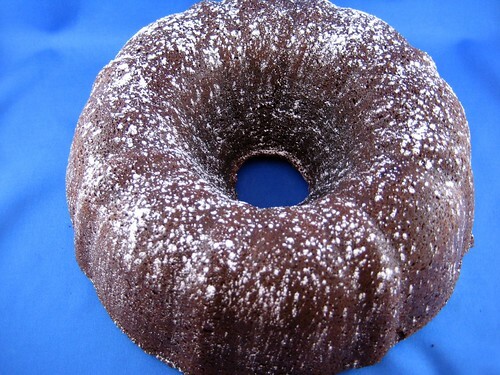 It’s moist and chocolatey without being too sweet. My coworkers loved it, even calling it amazing and delicious, so you can bet this recipe is a keeper! Preheat the oven to 350 degrees. Coat a 12-cup Bundt pan with cooking spray. Mix the cocoa and chopped chocolate in a heatproof bowl. Pour boiling water over the chocolates and stir to melt. Let the mixture stand to cool (about 2 to 3 minutes). Meanwhile, combine the flour, salt, and baking soda in a medium bowl. Cream the butter, brown sugar, and vanilla until creamy in a large bowl. Add the eggs to the butter mixture and blend well. Fold the sour cream into the cooled chocolate mixture until incorporated. Add the flour mixture and the sour cream chocolate mixture to the butter mixture and blend well. Add the chocolate chips to the batter and stir to incorporate. Pour the batter into the prepared pan and bake for 55 minutes or until an inserted toothpick comes out clean. Cool the cake slightly before removing from the pan. Sprinkle the cake with powdered sugar and serve. Recipe from Daisy (yeah, the “dollop of Daisy” people).